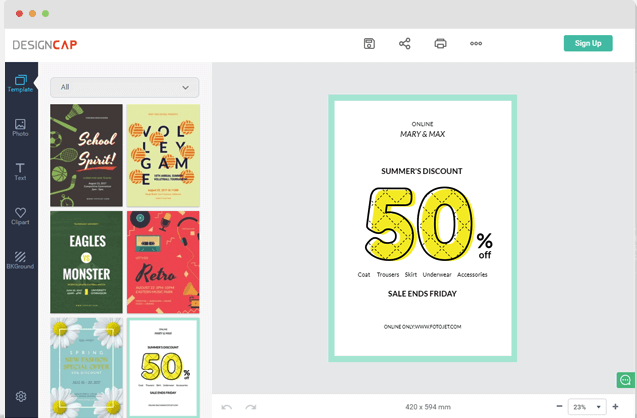 DesignCap is a new web tool you can use to create awesome posters and visuals. The tool is free, simple and easy to use. We have been tinkering with it for a bit and we think it is worth featuring here in our blog. As a teacher, you can use DesignCap to create educational posters to use in class and share with your students. You can do this in three easy steps: choose a poster template from the gallery. There are tons of professionally designed templates to choose from. Browse through the collection to find the one you like then click on it. Next, customize the layout and content of your poster. You can change things such as poster background, text fonts, add clip arts, upload your own photos and many more. You can enhance your posters by adding elements from DesignCap’s library such as clipart images, shapes, fonts…etc. When your poster is ready you can share it with others in social media websites, save it to you computer, or print a copy. If you are familiar with Piktochart you will find DesignCap similar to it. As for the editing options, DesignCap offers way more intuitive tools to help you create beautiful visuals. These include “adjusting size, position, rotation, changing text font, color, effect, alignment, applying specific background and managing layers.” As we stated earlier, this tool is free and does not require any software download but you need to sign up if you want to save and share your posters. Registration is free. Give DesignCap a try and see if you like it.